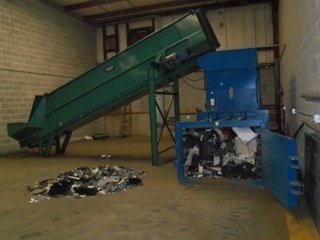 Utilizing a baler allows you to recycle your plastics in bulk. By baling your plastics, you are also reducing the amount of space needed for your plastic recycling as well as making it easier to load, ship and store. Do I Have To Pay Up Front For A Baler? 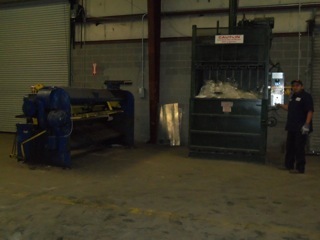 Atlanta Polymers provides vertical and horizontal balers at no up-front cost to you. We install the baler you require, and you make the payments with the scrap collected from the baler. When the baler is paid off, you will receive the future revenue from the recycled plastic. One bale of plastic is about the same weight as an entire truckload of loose plastic. For example, HDPE scrap weighs about 22-25 pounds per cubic yard if it is loose. By baling the material, it can be condensed to about 400-500 pounds per cubic yard. PET scrap can yield up to 600 pounds per cubic yard after it is baled. How Much Space Does a Baler Require? First we will have to evaluate the process and determine if a vertical or horizontal baler is needed. After we have that information, we will be able to calculate the baler footprint. With that information, you will be able to put the baler in the most effective area at your facility.